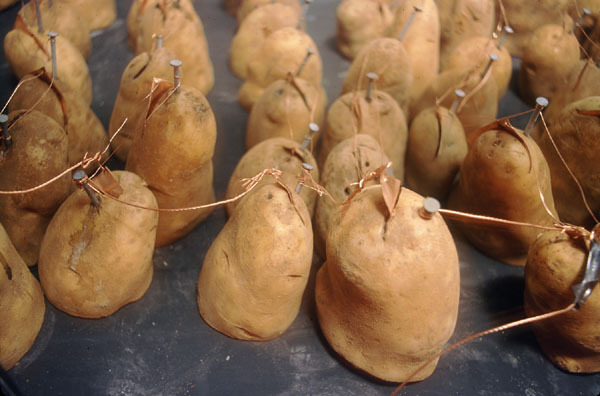 I built a potato battery out of 500 pounds of potatoes. It powered a small sound system. 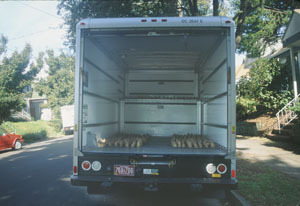 With the help of the Red 76 crew I installed the battery and sound system in the back of a U-Haul truck and drove it around town inviting people to enter the truck and take a listen. Batteries work by allowing electrons to pass from one electrode to another. In this case the potato provides phosphoric acid, which enables a chemical reaction causing electrons flow from copper to zinc. The zinc came from galvanized nails and copper came from small pieces of copper. You don't have to use potatoes; any acidic medium such as citrus fruit will work. I chose potatoes because they are traditional and cheap. 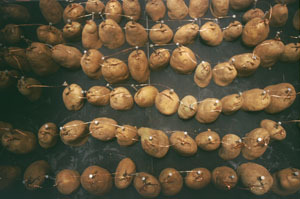 Each potato generates about 0.5 volts and 0.2 milliamperes. I connected groups of potatoes together in series to increase voltage and then connected these groups together in parallel to increase amperage. The entire 500 lb battery generated around 5 volts and 4 milliamperes. Don't eat potatoes after using them for a battery.